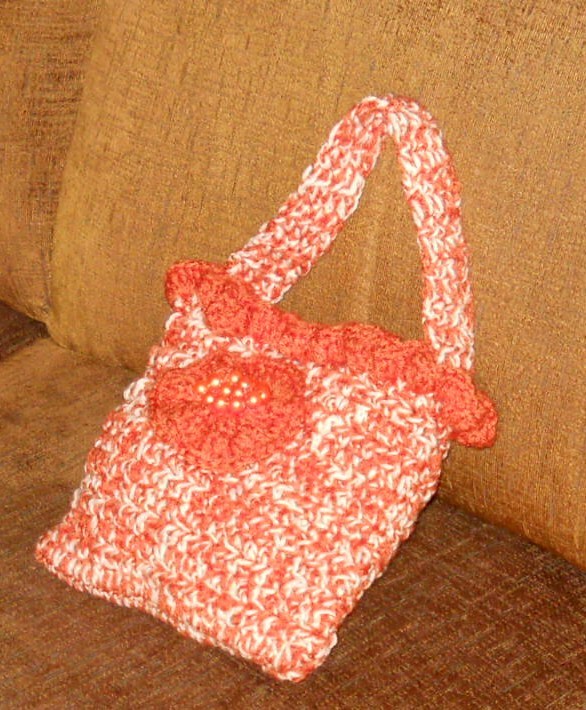 Beautiful Lil’ Orange Tweed Purse, Hand Crocheted with two pieces of High Quality Yarn (peach & orange). Very dense and made to hold all of your accessories! 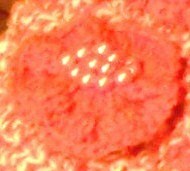 It is embellished with a large Orange Pearl Center Flower, and a Ruffle Edge. Easy Care: can be Machine Washed & Dried and is professionally finished with no loose ends. Another Designer Original from Jewels Designs, Copper & More Shop. Makes a fantastic Summer Gift, or buy it for yourself and add the color of 2012 to your wardrobe. 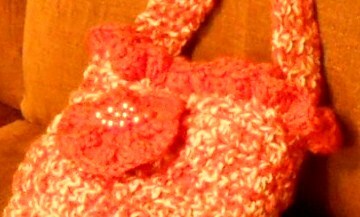 Custom Orders always welcome, if you would like a larger size or other color combos. I call this a “Vintage” Dale Earnhardt Jr Blanket, because it’s Juniors original number 8, and a Collectors Piece. Where do you think you could find an item with his original number? Do you know someone who LOVES Earnhardt Jr and would like a blanket like this one? Check out Jewels Designs Sports Team Blankets for all of our designer original pieces. All of our blankets are Hand Crocheted with Premium Yarn. They’re Easy Care, just Machine Wash & Dry, and they won’t bleed, fade, shrink or unravel. Our Blankets are Professionally Finished and there are no loose threads! All of our NASCAR blankets are extra special, because it takes a lot of time and effort to get them to look like the above piece. These are Charted (Intarsia) Crochet Blankets, and this one has 5 colors changes, which is very difficult. These blankets take longer to create (longer than our 2 color pieces), 6-8 weeks, but they are well worth the wait. If you would rather have Juniors current number we can do that too! Custom Orders are always welcome at Jewels Designs. We can re-create any team/club logo-Emblem in our design, just send us an email with your preference. Makes a fantastic gift for any sports enthusiast! These are all Limited Edition Art Pieces, that will never be over produced, we guarantee it! What are you giving your Dad for Father’s Day? Does he love Sports? Does he love Designer Original Art? Well, look no further! Check out Jewels Designs Sports Team Blankets Shop, and get your Dad that perfect gift, one that all his friends will be green with envy over. Give him a Jewels Designs, Limited Edition Sports Team Blanket. We can re-create any team or club emblem in our design. Custom Orders are always welcome, and we can even personalize your blanket with a Name (up to five letters), 3 letter Monogram, or Date. All of our Blankets are Hand Crocheted with premium quality yarn, and Easy Care, just Machine Wash and Dry and they will never fade, bleed, shrink, or unravel. Each piece has 40+ years of crochet excellence to back it up. Professionally finished Edges and no loose threads, are a mark of professional excellence. We guarantee that your piece will never be over produced. Each blanket we create is a limited edition work of art. So, order your Sports Team Blanket today! It takes 2 to 4 weeks to create each piece. Who says you can’t give your Dad the best, at a reasonable price? Is your Dad Unique? Dose he love art? Well then, you need to check out Jewels Designs, Sports Team Blanket Shop! What, we don’t have his favorite team? No worries, we can re-create any Team in our design. Custom Orders are alway welcome at Jewels Designs. We hand Crochet every blanket we sell, with Premium High Quality Easy Care Yarn. Just Machine Wash & Dry, no need for a Cleaners. Won’t Bleed, Shrink, Fade or Unravel. Each piece is Professionally Crocheted with 40+ years of experience! A true test of a professionally crocheted piece is the finished edges and no loose threads. That’s exactly what you’ll get from a Jewels Designs Hand Crocheted Work of Art. Each blanket is made to last for generations and is of heirloom quality. We hold the only pattern for our blankets and each is a Limited Edition Piece. They will never be over produced. So get your Dad something he will love and be able to pass down to his grandchildren. Get him a Jewels Designs Sports Team Blanket. If he’s a member of a Club, we can re-create his club emblem.